For related races, see 1804 United States elections. Presidential election results map. Green denotes states won by Jefferson, burnt orange denotes states won by Pinckney. Numbers indicate the number of electoral votes allotted to each state. 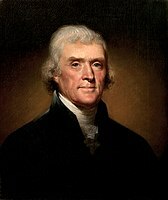 Although the presidential election of 1800 was a close one, Jefferson steadily gained popularity during his term. American trade boomed due to the temporary suspension of hostilities during the French Revolutionary Wars in Europe, and the Louisiana Purchase was heralded as a great achievement. Jefferson's victory was overwhelming, and he even won four of the five New England states. Pinckney won only two states, Connecticut and Delaware. This was the first election where the Democratic-Republicans won in Maryland, Massachusetts, New Hampshire, and Rhode Island. This was the last time that Massachusetts voted for the Democratic-Republicans until 1820, and the last time that New Hampshire and Rhode Island voted for the Democratic-Republicans until 1816. (a) Only 11 of the 17 states chose electors by popular vote. Results by county explicitly indicating the percentage of the winning candidate in each county. Shades of blue are for Jefferson (Democratic-Republican) and shades of yellow are for Pinckney (Federalist). ^ a b c Deskins, Donald Richard; Walton, Hanes; Puckett, Sherman (2010). Presidential Elections, 1789-2008: County, State, and National Mapping of Election Data. University of Michigan Press. pp. 41–42. ^ Zahniser, Marvin (1967). Charles Cotesworth Pinckney: Founding Father. University of North Carolina Press. pp. 243–246. Wikimedia Commons has media related to 1804 United States presidential election.